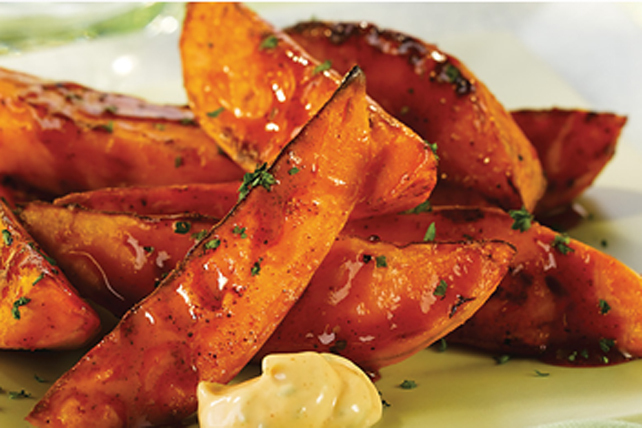 The cool and creamy lime-flavoured sauce is the perfect complement to these crisp grilled sweet potatoes coated with the magic combo of chili powder and spicy barbecue sauce. Reserve 1 Tbsp. barbecue sauce for later use. Mix remaining barbecue sauce with flour and chili powder until blended. Toss with potatoes in large bowl until evenly coated. Spread onto large sheet of heavy-duty foil sprayed with cooking spray; fold foil to make packet. Grill 30 min. or until potatoes are tender and lightly browned, turning frequently. Mix dressing, lime zest and reserved barbecue sauce until blended. Place potatoes on platter; sprinkle with parsley. Serve with dressing mixture.